The treasures of Iran tour reveals and uncover the fabulous insight into life in modern day Iran. We explore one of the most surprising and fascinating land you have ever visited. Note 1: Please note that this itinerary will change according to passengers’ flight details and arrival time. Note 2: The priority in sightseeing may be changed due to the time of your arrival, preference of your guide and also official and unofficial holidays of some museums. Note 3: Check-in time for the hotel is at 2:00 PM. According to your arrival time, if you need early check-in you must book an extra day. After arriving in Tehran from Imam Khomeini International Airport (IKA) our professional tour guide will meet and greet you then you will be transferred to hotel for rest. This morning we take you a World Heritage Site, the lavish Golestan Palace. Built during the Qajar Dynasty that rose to power in the late 1700’s, this fabulous walled complex is centered on a landscaped garden with tranquil pools. Many of the elements you’ll admire today date to the 19th century when local Qajari architects and artisans were looking to integrate traditional Persian style with elements of Western and Russian origin. The palace buildings are among the oldest in modern Tehran and they are still regarded as a crowning achievement of the Qajar era. Time permitting, we can walk around Tehran Bazaar, few steps far from Golestan Palace. Continue along the Bazaar route, we go to the Timche Akbarian for having lunch. Timche Akbarian dates back to almost 260 years from the Qajar era when its main purpose was for exchange and gold. Later it was developed into the first bank of Iran ran mainly by Jews who were the prominent residents of Oudlajan neighbourhood. As of today, there’s no bank or money exchange but the place has been delicately restored into a Dizi Sara and the tea house where tea comes in thin waist cups and along with sugar canes. Dizi doubtlessly is one of the most delicious and traditional Iranian food. Eating it has a special custom. Dizi is a Mesopotamian stew usually made with lamb, chickpeas, white beans, onion, potatoes, tomatoes, turmeric and dried lime. Everything is mixed and cooked together. In the afternoon, you’ll go to see National Museum of Iran which is an institution formed of two complexes, including the Museum of Ancient Iran and Islamic Era. We will also visit the Carpet Museum of Iran, home to a dazzling collection of Persian carpets collected from around the country and representing centuries of extraordinary art and skill. Today we will move toward Hamedan. Hamedan province is situated in the Middle Western Iran. The province is famous for its raisins (1500 hectares of vineyards) and in the Persian rug trade, it ranks second only to Kerman. Hegmatane Archeological Palace is located in the city of Hamadan, dating to the 6th century BC. Its structure is from the times of the ‘Medes’. ‘Kiyakesar Madi’ and ‘Nabopolasar Baboli’ were responsible for building this structure in the year 614 BC. As Avicenna were Muslim Persian physician and philosopher and wrote almost 450 treatises on a wide range of subjects, of which around 240 have survived. In particular, 150 of his surviving treatises concentrate on philosophy and 40 of them concentrate on medicine, our next step will be Avicenna Tomb. The next fascinating step will be Gonbad-e Alavian (or Alavian Mosque) which is a four-sided interesting 12th-century mausoleum belonging to the late Seljuk period. On the exterior, it resembles the Gonbad-e Sorkh of Maragheh. Our next site to visit is the tomb of Baba Taher, which is located in a park, surrounded by flowers and winding paths. Baba Taher is known as one of the most revered and respectable early poets in Iranian literature. He was known by the name of Baba Taher-e Oryan, which suggests that he may have been a wandering dervish. His poetry has touched many souls. The next place is Ganjnameh Inscriptions. These inscriptions are relics from the period of ‘Darius’ and ‘Xerxes’ of the Achaemenian era. That are located at the end of the Abbas Abad Valley and have been engraved on a mountain. You will visit one of the beautiful sightseeing in Hamedan is called Esteroo Mord Khay (Ester and Mord Khay) Tomb. This is the tomb of Ester the Queen of Shoosh (the wife of Xerxes of Iran). Mordecai (Mord Khay) was her uncle. Its structure has been constructed of brick and stone about 11 centuries ago, in order to pay homage to these two personalities. This vicinity is a place for pilgrimage of the Jewish sect and is also held in respect by the Moslems. 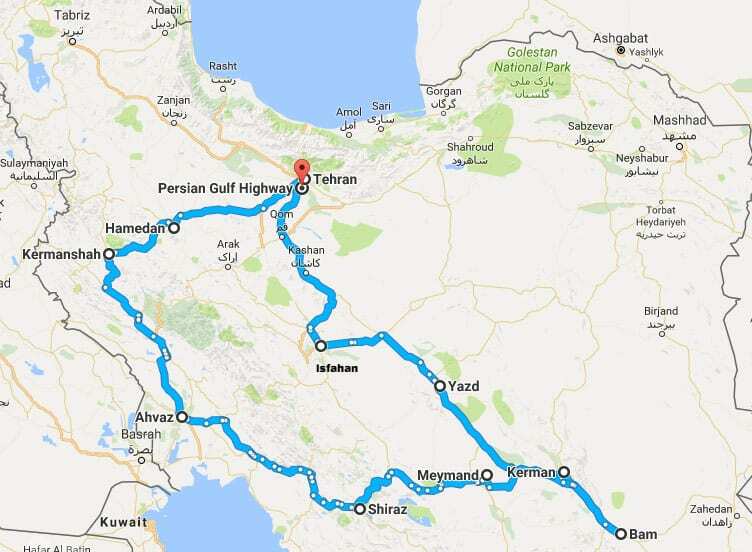 Then drive to Kermanshah. On our way to Kermanshah, you will visit Anahita Temple at Kangavar. Bear in mind that there are two different sites that are attributed to Anahita, a Persian Diety, who is associated mostly with wisdom, fertility and healing. The one you are going to visit is the larger one and the more famous one, and it is located in Kangavar. Although there only some remains of the temple left to explore, you might find some interesting similarities between this temple and the one built for Athena in Greece. It will be an exciting site to explore. Then you will visit Achaemenian inscriptions at Bisotun (A registered site in UNESCO world heritage) which are among the largest rock reliefs in the world. These carvings and inscriptions tell us a story. The story of Darius the Great and his victories in battlefields. The carvings are so detailed that it leaves you wondering how Achaemenians managed to leave such a rich legacy behind, a legacy that still remains today and still managed to surprise the modern man. Today, you will visit Sassanian Bas-relief at Tagh-Bostan, it is an archaeological site which belongs to Sassanid dynasty. The carvings are mostly centered on the glories and victories of Sassanid kings. They are the example of some of the finest sculptures in Iran. What is most interesting is that these carvings have endured hundreds of years of strong winds and rain and yet they are still firmly standing. Then you’ll have time to explore and shop in the large and ancient bazaar of Kermanshah. One of the noticeable and important buildings of Kermanshah is this, and its primary structure is related to the Qajar period. This bazaar is adorned in a splendour style. The goods available here are: local coloured apparel, handicrafts like giveh (a local foot-ware), shoes, carpet, Kilim rugs, wooden kitchenware, leather and felt and hand-woven articles. We departure from Kermanshah towards Susa to see the exquisite beauty of the magnificent Chogha Zanbil Temple, the temple belongs to Elam Period, 3200 years old. It is one of the few extant ziggurats outside Mesopotamia. Archaeological excavations undertaken between 1951 and 1962 revealed the site, and the ziggurat is considered to be the best-preserved example in the world. In 1979, Chogha Zanbil became the first Iranian site to be inscribed on the UNESCO World Heritage List. After visiting Haft Tape Museum near the Ziggurat, we’ll visit the Tomb of Daniel, a very famous Jewish saint. We’ll continue the tour and will drive to the next city known as Shoushtar where is popular for waterfall and mills, the old water reservoir system of Persia. In this city, you’ll see a Historical Hydraulic System (A registered site in UNESCO world heritage) and a traditional house. Later, we’ll continue the way to Ahvaz. In the morning, we drive to Shiraz. But on the way, we’ll have a chance to visit several outstanding sites dating back to Elamite (3-5 thousand years ago) and Sassanid eras (1800 years ago). These monuments are interesting and worth visiting. Bishapour city remains is situated south of modern Faliyan in the Kazerun County, on the ancient road between Persis and Elam. The road linked the Sassanid capitals Istakhr (very close to Persepolis) and Ctesiphon. The next marvellous step will be Tang-e Chogan which is a valley with a running river to the north of the Ancient City of Bishapour. There are 6 rock reliefs telling the story of the Roman Empire defeat by Sassanid king, Shapur II (309 -379) and also King Bahram II (276–293) conquering Arabs and rebels. Continue to Shiraz and check in to our hotel. After breakfast, you will start your full day tour of Shiraz. At first, you will visit Nasir-al-Mulk Mosque (Pink Mosque) few steps far from Vakil Bazaar. It built by the order from one of the lords of the Qajar Dynasty, Mirza Hasan ‘Ali Nasir-al-Mulk, it took 12 years to complete in 1888. Its interior reveals a magnificent masterpiece of design with stunning colors. This is a space where light and worship intertwine. The mosque comes to life with the sunrise and colours dance throughout the day like whirling dervishes. It reflects on the ground, walls, the arches and the towering spires. It even reflects on the visitors as if a colourful ball is hit by the first sun ray and explodes to thousands of butterflies all around. You walk to Pars museum to see the amazing paintings from the time, the Karimkhan tomb inside the pavilion and Nazar gardens. After that, you’ll have time to explore and shop in the bustling Vakil Bazaar, home to hundreds of stores, beautiful courtyards, and even an ancient caravanserai. You can visit Holy Shrine of Shah-e-Cheragh. Shah-e-Cheragh is the most important place of pilgrimage within the city of Shiraz. The tombs became celebrated pilgrimage centres in the 14th century when Queen Tashi Khatun erected a mosque and theological school in the vicinity. Ahmad (Shah-e-Cheragh) came to Shiraz at the beginning of the third Islamic century (approximately 900 AD) and died there. During the rule of Atabeg Abū Sa’id Zangi (1130s AD) of the Zengid dynasty, the chief minister to the monarch by the name of Amir-Muqarrab-al-din Badr-al-din built the tomb chamber, the dome, as well as a collonaded porch. Shiraz is famous for its gardens and we’ll visit the Eram Garden with its aromatic myrtles, beautiful flowers, fruit trees, and towering cypress (one of which is said to be 3,000 years old). End your day in Shiraz on a tranquil note in the lovely garden Tomb of Hafez, one of our most outstanding poets to feel the taste of Persian Literature. Hafez is one of the great poets who impressed everyone with his mastery. His poems give us a special feeling and the peace in his tomb is really outstanding. Tonight is we try local Shirazi food and a must try in Shiraz is a Shirazi salad, made of tomatoes and onions which is delicious in its simplicity. We have a full day of driving today to reach our destination of Meymand village; it is a good idea to stock up on locally bought and easily found dates and pistachio nuts for the journey. Darius built the terrace, the Apadana (great audience hall), the Tachana (palace), the monumental staircases and his son, Xerxes, added the harem and the Hall of 100 Columns. Alexander the Great entered Persepolis in January 330 BC and then committed an uncharacteristic act of wanton destruction that still mystifies historians today, burning the mighty city to the ground. Though a shadow of its former self, the soaring pillars, terraces and sculptures of Persepolis still remain, probably most impressive are the bas-reliefs which line the site, telling the story of ancient governors and kings that came to Persepolis to pay tribute to the Persian Emperors. We’ll continue to Meymand and overnight in the local house. Today will be spent visiting Meymand, an exotic village; in which people are living in a kind of stone house/cave. This village has won the international Melina Mercury Prize, because of the adaptation of human being and nature. Then we move to Kerman to discover how people adapted their life to a desert city surrounded by mountains. In Kerman visit Ganjali Khan Complex. The complex is composed of a school, a square, a caravanserai, an Ab Anbar (water reservoir), a mosque, a bazaar and a bathhouse. You will uncover Iranian old style bath in Ganjali Khan Bath of Kerman. Today by visiting Moshtagh Alishah tomb, you have an opportunity to get acquainted with Sufism and mysticism. Then you will see Kerman Jame mosque and its majestic Persia structure. After lunch, drive to Shahdad is located at the edge of the Lut desert, for visiting a wonderful scenery of desert in Kaluts. Kaluts are the wonderful sandy shapes created by wind or water erosion. They are the most beautiful natural phenomena. They are unique and can’t be found in any desert of the world. In the evening, we will return to Kerman. Early excursion drive to Rayen, visiting the citadel of Rayen. Rayen Citadel is considered the biggest earthen structure of Kerman province after Bam Citadel. Leaving Rayen behind, we will travel to Bam to visit a unique mud-brick citadel of Bam (A registered site in UNESCO world heritage). Today on the way back you will stop in Mahan. Meet Sufis who have travelled a long way to paying homage to their Sufi master Shah Nematollah Vali in his shrine. Get relax in Shahzadeh Garden and admire a great example of Persian gardens that depicts a high contrast between a green garden and a harsh dessert at the background. Then we will continue to Kerman. Then we continue to Yazd. On the way to Yazd visit Zein-Al-Din Caravanserai of Mehriz. Robat Zein-Al-Din, a masterpiece of architecture from Safavid era, is a beautiful traditional caravanserai, restored to its original glory. This caravanserai is orbicular from outside and twelve findings from inside. You enter the circular structure through a small wooden door and you find yourself in a beautiful courtyard. It has succeeded in obtaining the award for the best repair in the year 2006 by the UNESCO and has been known as one of the 101 superior hotels in the year of 2009. Yazd is one of Iran’s oldest continuously inhabited towns, its silhouette punctuated by minarets and the ingeniously-designed wind towers that capture desert breezes to cool homes during the hot summer months. Yazd is also the center of Iran’s Zoroastrian community, which is where you’ll begin the day’s sightseeing. At the Tower of Silence, you’ll learn about one of the traditions of this ancient pre-Islamic religion: Until the mid-1900’s, the dead were transported to this tower where they were left to decompose and be devoured by birds. Zoroastrian tradition considers a deceased body to be “unclean” and this process of excarnation prevents contact with either fire or earth – both of which are considered to be sacred. At the still-active Zoroastrian Fire Temple, you’ll see a flame that is said to have been burning for the past 1,500 years. It’s an important pilgrimage site for the faithful and here our expert guide will offer additional insight into one of the world’s oldest monotheistic religions. In Amir Chakhmaq Square, you’ll see a very impressive Hussainiya – a congregation hall for Shia commemoration ceremonies. With three tiers of recessed alcoves, all perfectly proportioned, its façade is one of the city’s most photographed landmarks. Then visit the Friday Mosque, built in 1324, where you can gaze upon the tallest minarets in the country. At Zendan-e Eskandar, you’ll find an ancient domed structure with a deep, circular brick-lined pit that resembles a dungeon. According to legend, the complex was built by Alexander the Great to hold prisoners during his conquest of Persia. Others believe it was constructed by the Persians to hold Alexander himself. Among the many other historic sites to be seen in Yazd are beautiful old homes and the Dowlat Abad Garden. Standing by the garden’s long reflecting pool, you’ll be shaded by ancient cypress trees. Ahead of you is an 18th-century hexagonal pavilion with a beautiful stained glass window and a graceful wind tower – the tallest in Iran. All around are flowering fruit trees and other ornamental plants and trees. Leaving Yazd behind, your first stop this morning will be in Meybod, where your first impression might be its striking monochromatic architecture of desert brick. But set along an ancient trade route, Meybod also offers a number of fascinating sites to visit including its caravanserai. Built in typical Safavid style, this ancient desert inn features verandahs, shaded passageways, and nearly 100 rooms – some of which are now used as artisan workshops. At the local icehouse, you’ll learn about the thick-clay construction and subterranean chamber that allowed local residents to have ice and food storage before refrigeration – even during the intense desert heat of summer! Your overland journey continues to the small town of Na’in, an ancient community with origins dating back to the 8th century. At the local Ethnographic Museum, set in an erstwhile private residence of the Safavid era, you’ll learn more about the region’s cultural traditions. Continue to Isfahan and check in to our hotel. As the 17th-century capital of the Safavid Empire, Isfahan was one of the world’s greatest cities – architecturally striking, wealthy beyond imagine, and politically powerful with Europeans, Ottomans, Indians and Chinese coming to its court – the heart of a vast Persian Empire that stretched from the Euphrates River in present-day Iraq to the Oxus River in Afghanistan. Indeed, its grandeur inspired the rhyming proverb, Isfahan nesf-Jahan (Isfahan is Half the World). Continue your exploration in Isfahan at another UNESCO World Heritage Site. Simple at first glance but wondrous in its rich detail and bold design, the Masjed-e Jamé is another masterpiece of Iranian architecture, covering nearly 5 acres in the heart of this historic city. This is one of the oldest congregational mosques in the country, and its construction and embellishment over the past twelve centuries illustrate a number of important periods in Islamic architecture. Your foray into Isfahan’s architectural treasures continues at the Harun-e Velayat Shrine. Built in 1512, the shrine’s dome offers a particularly fine example of Iranian tile work. Gazing up at the graceful 11th-century Ali Minaret, the oldest in Isfahan offers further insight into the skill of Iranian architects and builders. This afternoon, your exploration continues in Imam Square. This 17th-century site is one of the largest public spaces in the world. Here in the square, you’ll visit the 17th-century Shah Mosque, revered as a masterpiece of Islamic architecture and easily recognized by its magnificent tile-work and soaring cupola and minarets. In the Ali Qapu Palace, you’ll marvel at its beautiful music rooms and the balconies where Safavid kings would sit to enjoy the polo matches unfolding in the square below. You’ll end your day exploring the Qeisarieh Bazaar that surrounds Imam Square. With hundreds of local vendors that specialize in traditional arts and crafts, it’s a wonderful place to shop for pottery, enamel, jewellery and delicately inlaid board games. Next up is Chehel Sotun. Set in a landscaped and forested park in front of a tranquil reflecting pool, this graceful pavilion was built by Shah Abbas II for entertainment and court receptions. Entering through a portico with twenty slender wooden columns, you’ll discover soaring halls embellished with frescoes, paintings and mosaics; the Hall of Mirrors is especially breathtaking! In the afternoon, you’ll return to the center of town to continue exploring the shops and landmarks that surround Imam Square. Other famous bridges on the Zayandeh River are Sio-ce–pol and Khaju. There are sluice gates below the bridge to let the water runoff from Zayandeh River in the spring, and there are beautiful stone archways above each gate. These archways provide a great acoustic place for every man who wants to sing. You can always find a man or a group of men singing under the bridge. The songs are usually about betrayal or unrequited love. You have the chance to chat with these men and listen to their songs. Leaving Isfahan behind, your first stop this morning will be in Natanz. In the town of Natanz, you’ll see the finely decorated, 13th-century tomb of Sheikh Abd al-Samad. Your overland journey continues to the Abyaneh village. Abyaneh Village is known as the Red Village because of its red soil and houses. The houses of Abyaneh bear an ancient architectural style, featured by the use of clay as the construction material and latticed windows and wooden doors. In Kashan, you will visit Boroujerdi and Tabatabaei Traditional House and Fin Garden (A registered site in UNESCO world heritage). This very early Persian garden reflects ancient landscaping principles that trace their roots to the time of Cyrus the Great in the 6th century BCE. In the afternoon, you will drive back to the capital. Our tour guide will transfer you to Imam Khomeini International Airport according to your’ flight time.